As someone who loves a range of hues at home, I’m always so drawn to edgy accents that sport high contrast color. But it’s not very often that I’ll find ready-made pieces that suit my specific go-to scheme. So, I’m teaming up with ScotchBlue™ again this season to share a simple two-toned painting project that adds tons of personality to plain white frames that you probably have on hand. Finished with your favorite muted or monotone art and photos, this project is the perfect way to add personalized style to your space. 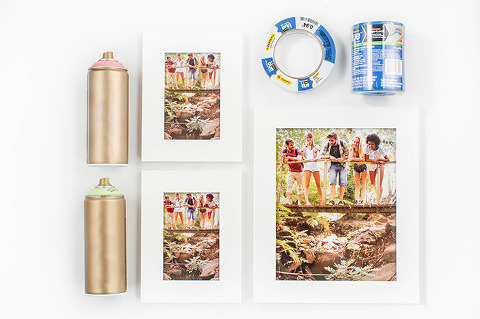 Grab your tape, plastic, and spray paint—this is gonna be a fun one! Note: Follow all ScotchBlue™ Painter’s Plastic package instructions for proper surface cleaning and prep, adhesion and removal. Before getting started, remember that proper prep ahead of time makes for the best finish, so make sure to wipe your frames down with a microfiber cloth to remove all dust and fingerprints before applying your ScotchBlue™ Products. Make sure the frames are completely dry and dust-free, only then should you start the masking process. To keep the white finish on the inside and outside edges of my frames, I used a roll of ScotchBlue™ ORIGINAL Painter’s Tape to mask off the profile. I’ve used this type of painter’s tape over and over on all sorts of DIY projects, and it consistently delivers professional results—I never use anything else (seriously!). 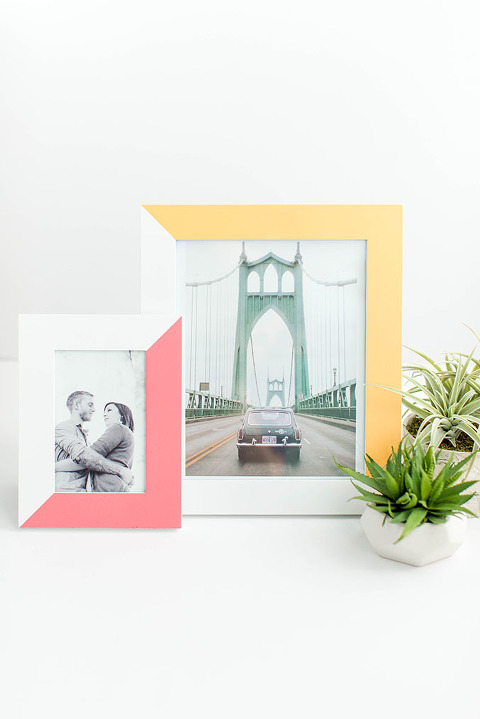 To use on your own frames, simply unroll about 8-12 inches worth of tape at a time, rip or cut with scissors to detach, and press the tape into place on the inner and outer edges of your frame. Now for the frame fronts. In order to give them the half-and-half, two-toned look I was going for, I unrolled and cut (there’s a built-in cut-off blade!) a few feet of ScotchBlue™ Pre-Taped Painter’s Plastic and, without stretching the tape, laid it carefully along one diagonal half of each of my frame faces. Make sure to press the tape firmly into place on your own frames, and then reach up behind the plastic to unfold it so that it hangs over the edges. Because this particular style of applicator offers painter’s tape and painter’s plastic, I didn’t have to worry about paint over-spraying onto any surface other than the scrap cardboard I used under the frame. I’m also a big fan of that built-in Edge-Lock™ Paint Line protector, which delivers super sharp paint lines. After taping off all of my frames by repeating steps 1 and 2 on each, it was time to paint! I laid the frames one by one on different sheets of scrap cardboard in our carport since it offered a well-ventilated area from which to work. Next, I made doubly sure that all of the painter’s plastic was still covering all areas of the frame that I didn’t wanted painted. Then, I sprayed a few thin and even coats of paint in three different colors on my three frames. Once the paint is dry to the touch, gently peel both the Painter’s Tape and the Pre-Taped Painter’s Plastic off of the frames, making sure to pull the tape back on itself slowly at a 45-degree angle. Discard the used tape and plastic. Let the painted frames cure in a cool place indoors for at least 24 hours before handing. After the paint is fully dry, you can enjoy them in your home by displaying them with favorite photos, postcards, or prints. Because of the bold colors of the painted frames themselves, I used photos and cards that were a little more muted in tone. I framed a favorite black and white portrait from our engagement photoshoot, a cheeky postcard, and a pretty photo I cut carefully out of a back issue of a magazine. What do you think? Would you give this two-toned painting project a try? Do tell in the comments!